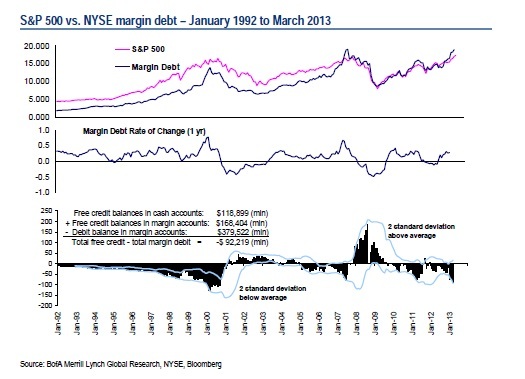 Leverage, as measured by NYSE margin debt, rose 28.3% on a yearly basis, and is now slightly below the July 2007 peak of $381bn. Leverage can be used as a sentiment indicator because it is related to investor confidence. It tends to be correlated with the direction of the equity market, investors are likely to gain confidence and add leverage when the equity market is going up and the opposite when the market declines.